I have to start this blog post with a huge apology, well, a few apologies, this is ridiculously late for a few reasons, firstly, my laptop broke on the first night of fashion week (silly Apple) - I did plan on writing this post that evening and when I opened it up, it decided to literally just break. It took me 2 weeks to get it fixed, as if that wasn't bad enough, I then lost my memory card with most of my photos on it (I still can't find it anywhere) so here is a look at my time at London Fashion Week 2015, some photos are from my phone because I luckily took loads on there and then I've put a vlog together too because luckily I didn't lose any GoPro footage hooray! I was SO excited to share this with you back in Feb but hey, better late than never! I feel like the most unorganised person in the world but I am finally getting back on my feet, note to self, back up my laptop next time so I don't lose absolutely everything! 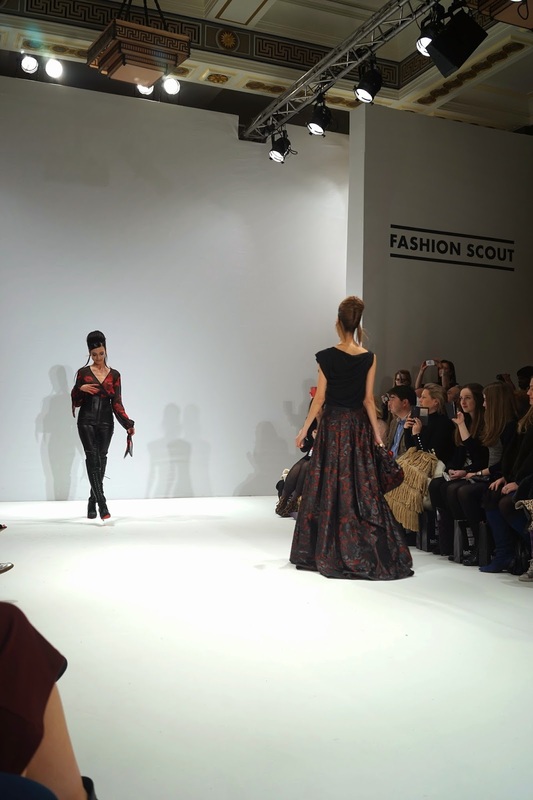 Let's talk about LFW 2015! I flew directly from Toronto (updated travel post coming your way soon!) to London for fashion week - as much as I wanted to stay and explore Canada some more, I didn't want to miss another fashion week. I was only meant to be popping back for fashion week but things have been so crazy and exciting at home that I've stayed around in the UK a little bit longer! I decided to go to fashion week ridiculously last minute and most hotels were full in London but I managed to get a space in the Premier Inn in Waterloo. It was incredibly well placed, really close to everything (not walking distance but I taxied everywhere anyway - Uber taxis are the best, use promo code w8rm4 on the Uber app to get £10 free - you can use them around the world) so it was really handy for fashion week. A jet lagged me arrived after a very long flight at around 8am to drop my bags off and the lovely staff at Premier Inn put me in a room until my room was ready, I was so happy to be able to freshen up and rest my head for an hour or so. After my nap, an amazing member of staff came and moved me to one of the top floors and I had the most amazing view - just the same as a view you'd get from a 5* in London. It was a pleasure to look out of the window. I've stayed in a Premier Inn once before and have always had a good experience, it was easy, comfortable and the view was just insane. Time moved really quickly and I had to move my sleepy head and get going to the first show of the day! I went backstage with The Body Shop to a lot of the shows as they did all the make up for the shows at Fashion Scout. As you can imagine, it was pretty crazy and pretty hectic back there but it's amazing to see the looks and it's amazing to know that all the make up on the shows I watched was done by The Body Shop! I had one day to buy some outfits for fashion week whilst I was in Canada (how unorganised can one get?!) so I rushed to Zara and fell in love with this dress. It was expensive but you can get similar online here at Missguided (in love with this one! ), here, here and here (this one is so stunning) at ASOS. I am wearing the shoes I always wear, they're online here - if they're sold out you can get the same ones here. London Fashion Week is always a great excuse to catch up with other bloggers and friends. I got to catch up with the lovely and beautiful Danielle Peazer and I also got to meet the gorgeous Daisie Smith. I made sure I got my make up touched up by The Body Shop backstage between shows though - last year I was so hot and flustered throughout fashion week! Zeynep Kartal is my all time favourite designer, I adored the designs last year and this year blew me away even more. I basically want my whole wardrobe designing like this and my wedding dress please. I think this is my favourite outfit ever! After the shows I ran around London grabbing drinks and dinner with different friends, it was great to catch up with some of my favourite people! The next morning I was invited to Rare London's blogger breakfast, something I was so excited for! Rare's event was at one of my favourite hotels, The Savoy. We were invited to preview the exciting new SS15 collection and seriously, I fell in love with it all. I haven't really ever shopped at Rare before but trust me, I want everything now. The muffins were so good, I had two. It was also a great excuse to catch up with my one of my favourite friends, Victoria. Victoria kindly took some photos of my second outfit, another one from Zara - as much as I like it, even the smallest size was very big so it sags quite a lot at my crotch and looks a little bit dodgy. This was pretty expensive, typical Zara but you can get a similar knitted vest top here - I can't find any similar knitted trousers but you can get similar flared trousers here and here and if it's a brown jumpsuit you're after rather than a two-piece like mine, this one here is pretty nice! The boots (I wasn't lying when I said I never take them off!) are available (and in stock) online here and here. I wore my trusty Daniel Wellington watch (15% off here with promo code emtalks) - my Dorothy Perkins leather jacket and my Ray-Bans. These are some of my favourite pieces from the new Rare collection - I feel like this two-piece screams my name! This maxi dress was stunning too and got me excited for Summer! I got my hair done on the day by the London Hair Academy - they added some curls in and I loved it. I caught up with my lovely friend Ashley James and we headed (along with my other long-time friend Scarlett Dixon) to the Aspinal of London press day. You should all know by now how much I adore Aspinal by now, their Etre Cecile collaboration is pretty crazy but it's nice to see them doing something so different. I can't wait to get my hands on their Summer collection! For the parts I didn't capture on this memory card (technical problems! ), you can watch on my vlog below hooray because the fun certainly didn't stop at Aspinal! It's time to show you lots of food, give you front row access to lots of shows and I even take you to the Pam Hogg show! A huge thank you to The Body Shop for looking after me so well! Do you want to go to fashion week at any point? Do you like my outfits? How do you feel about fashion week and fashion in general? Do you like the look of any of the shows I attended?